During the past three decades, the U.S. armed forces have been called on repeatedly to operate in the deserts of the Middle East and southwest Asia. Avoiding locations susceptible to extreme dust emissions and other terrain-related hazards requires the ability to predict soil and terrain conditions, often from limited information and under dynamic environmental conditions. This paper reports the approach used to develop an integrated, predictive tool for forecasting terrain conditions to support military operations in desert environments at strategic, operational, and tactical scales. The technical approach relies on the systematic integration of desert landform parameters in geomorphic models for predicting terrain conditions. This integrated effort is performed in a geographic information system (GIS) framework using expert-based analysis of airborne and spaceborne imagery to identify terrain elements. Advances in earth science research have established that unique, predictable relations exist among landscape position, soils, vegetation, and geology. Furthermore, new instrumentation allows the collection of a wide range of environmental information to characterize surface and subsurface conditions. 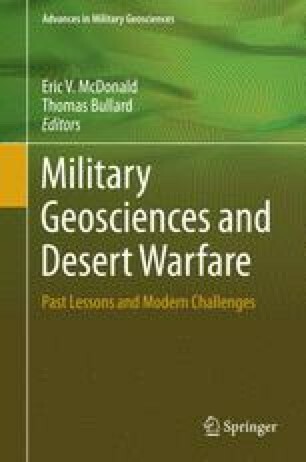 By integrating models and methods from geomorphology, soil science, climatology, and atmospheric science with remote sensing and other technologies, a predictive model can be developed to support military operations. Funding for this project is from U.S. Army Research Office (Terrestrial Sciences) grants DAAD19-03-1-0159 and W911NF-09-1-0256. Any opinions, findings, and conclusions or recommendations expressed in this material are those of the author(s) and do not necessarily reflect the view of the U.S. Army Research Office. We thank the many scientists at the Desert Research Institute, Hebrew University, the Geological Survey of Israel, and the University of Washington have partially contributed to this project. We also thank personnel at the US Army Yuma Proving Ground, US Army National Training Center, Fort Irwin, and the National Park Service for support and access to critical desert areas for conducting field research.